"Karol is an exceptionally talented motivational speaker who wowed the crowed at TEDxTimesSquare. If you are looking for a speaker who can entertain, educate, and inspire through storytelling, Karol is the perfect choice!" SVP Research & Advisory Services at CB Insights. Karol Ward, L.C.S.W. is a motivational speaker who helps audiences understand the psychology behind why they do what they do. As a speaker and author she is able to both explain and encourage her audiences to make the changes they need to live more fulfilling lives. With her conversational style and training as a therapist, Karol shows audiences how to find inner confidence in their personal and professional lives. Karol brings her background as therapist, confidence expert and communication consultant to conferences, companies and organizations that are looking for solid information on personal and professional development. She is the author of Worried Sick: Break Free From Chronic Worry to Achieve Mental & Physical Health (Berkley) and Find Your Inner Voice: Using Instinct and Intuition Through the Body-Mind Connection (Career Press). Karol has been featured as a psychological and communication expert on CNN, NBC, ABC, Fox News, and The Wall Street Journal live. In addition, she has been a contributing expert to Oprah.com, Cosmopolitan, The Independent, Women's Day, The Wall Street Journal, The New York Daily News, Family Circle Magazine, Teen Vogue, Yoga Journal, First for Women, Spirituality & Health, Bustle.com along with numerous radio programs and podcasts. .
Karol combines her training as a psychotherapist with her passion for communication by conducting a variety of psychology, wellness, and communication presentations for such clients as: The Clinton Global Initiative, Paul, Weiss, Rifkind, Wharton, Garrison LLP, Viacom, Simpson, Thacher & Bartlett LLP, The 92nd Street Y, The Renfrew Center Foundation Conference, IDEA Health and Fitness Association, Integrative Health Symposium, Polycystic Ovarian Association Conference, NAVEL Health Expo, Financial Women's Association, The Educational and Cultural Trust Fund for The Electrical Industry, Fashion Institute of Technology, American Business Women's Association, Hunter College and The Society for Jewish Science. .
Karol has a BA in psychology and communication, an MSW from Fordham University and is certified as a Level II EMDR practitioner. She is a member of the National Speakers Association, Toastmasters International, and the National Association of Social Workers. "As a professional speaker and speaking instructor for over two decades, I am used to watching and listening to presenters with a critical eye and ear. Usually, I can fill a notebook with "room for improvement" comments about a speaker's message, organization, and delivery. But as soon as Karol Ward took the stage at the first meeting where I had the privilege of hearing her speak, I knew that my notebook would be empty. Karol's warm, engaging and polished speaking style makes everyone in the room feel like they are a part of her inner circle. More importantly, she helps her listeners recognize how their behaviors may be getting in the way of their own personal and professional success, and gently (but firmly) guides them to better choices. I have learned a tremendous amount from Karol about how to make changes in my own life, and also how to be a better speaker." 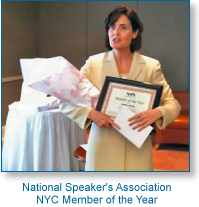 "Karol Ward is a dynamic speaker who brings humor and warmth to all her presentations. Karol's charisma is supported by a soothing, powerful speaking style that seamlessly incorporates her professional behavioral insights into her witty and observant views on the mind-body connection. Karol knows how to connect with her audience by displaying both a confidence and vulnerability that make her speeches rewarding, informative, and inspiring."